Swansea City are back in EFL Championship action on Tuesday night when Brentford visit the Liberty Stadium. It was a case of Déjà vu on Saturday for Swansea as they dominated Nottingham Forest at the City Ground only to lose to two late goals in a 2-1 defeat. The loss leaves Graham Potter’s team sitting in 15th place in the table and without a league win since 2nd March – ironically the last time the Swans played a league game at the Liberty. Brentford were held to a 0-0 draw away at Wigan on the weekend and sit two places above Swansea in the table in 13th place. Take a look at all of the historical results between the two clubs since their first meeting way back in 1921, when the Swans and Bees played out a 1-1 at the Vetch Field in Division Three South, on our Swansea City v Brentford Head to Head Statistics page. The last time the sides met in south Wales was in February this year, when the Swans ran out 4-1 winners in the FA Cup to book their place in the Quarter-Finals. Lancashire official Peter Bankes will be the referee for this Championship fixture. This will be the first time that Bankes has officiated a Swansea City game. Bankes has been the referee for two Brentford fixtures this season, the 2-1 win at home against Nottingham Forest last September – during which he issued 12 yellow cards – and the goalless draw at Birmingham City back in December. He has earned a reputation amongst fans for being ‘card happy’, having issued 113 yellow cards in the 23 Championship games he has officiated so far this season. Averaging almost 5 cards per game, it is easy to see why fans think this! Swansea may have lost their last four games in all competitions but the quality of their football has been to an excellent standard in these matches. And given the meetings between the sides this season, plus Brentford’s away form, I think Graham Potters men are good value to return to winning ways on Tuesday night. Brentford’s Championship campaign has been let down by their away form. The Bees boast just two wins out of nineteen Championship games on the road this season. The Bees will also be still without first choice goalkeeper Daniel Bentley for this fixture. Swansea are available at 13/8 (2.625) to win the game with Bet365. More optimistic punters may be attracted to the 13/5 (3.60) with SportingBet for a Swansea win in a game that has more than 2.5 goals. Given that Swansea have beaten Brentford twice this season already and both games have seen five goals (3-2 and 4-1). Image Credit: swanseacity.com – McBurnie scores against Leeds United. 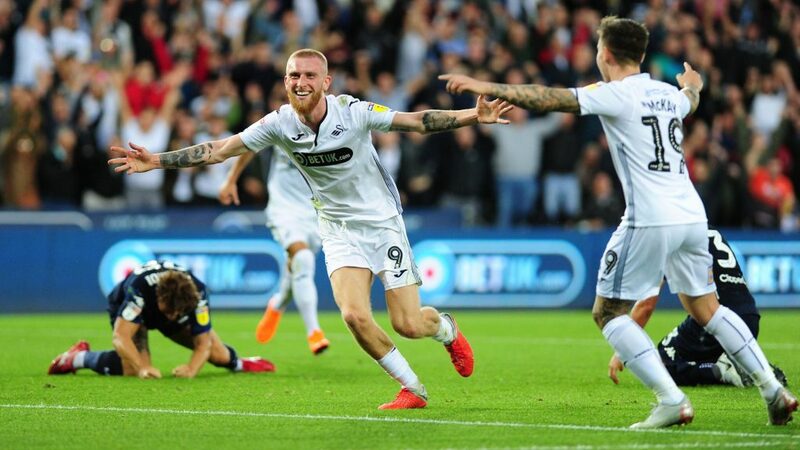 Oli McBurnie has scored 34.8% of Swansea’s goals in the Championship this season and odds of 5/1 (6.00) with BetUK for him to open the scoring are too good to ignore. ACCA backers are advised to back Swansea, Bury, Tranmere, Fylde and Leyton Orient. Bet 5 x four fold and 1 x five fold. The five fold pays just over 40/1 (41.0) with MarathonBet. Swans to win 2-0 at 13/8 (2.625) with Bet365. Swansea to win and over 2.5 goals in the game at 13/5 (3.60) with SportingBet. Oli McBurnie – First Goalscorer at 5/1 (6.00) with BetUK.